Do you know vinegaroon? They are insects that are like scorpions. They are in Kochi. In night, if you smell vinegar in forest, please look where you are stepping. Probably you can see them. Its average size is from 20 to 25mm. It is called `scorpion` because of its appearance. Japanese name is Sasorimodoki. But it is close to spider. It lives in tropical area and subtropical area. Vinegaroon has about 100 species. It has two spiecies in Japan. There are Typopeltis stimpsonii in Kyusyu, Typopeltis crucifer is on Yaeyama island. 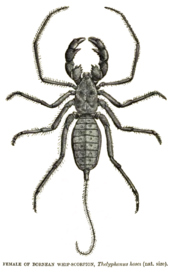 Kochi`s Vinegaroon is thought to be Typopeltis stimpsonii. It`s a range spreads every year and it live in Kobe and Ogasawara island now. We can recognize it by scissors form. 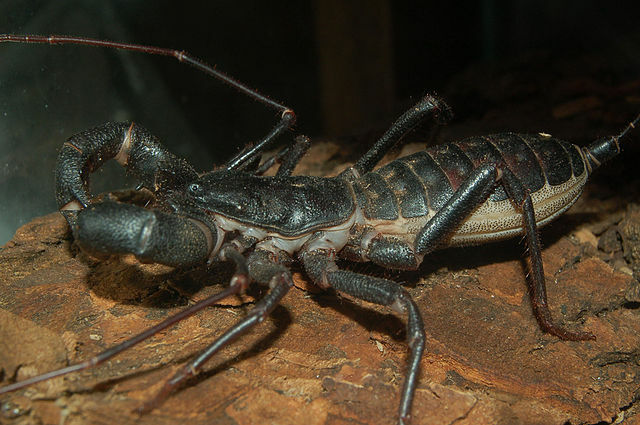 Kochi`s vinegaroon is thought that be brought by people. It lives under stones and prefer humidity. It`s staple food is insect, a cricket or a grasshopper. It is cannibalistic. It catches insect by using scissors. In winter, it hibernates. It has poison that smell vinegar. `Vinegaroon` cause this poison. If people touch this poison, causes Dermatitis and maybe loss of eyesight. If you touch vinegaroon, you must wash your skin. It is specified Endangered species in Kochi. In Kumamoto prefecture, it is specified Natural treasure. It is thought that its numbers are decreasing because it is carniverous and the number of cockroach or cricket which it feeds on is also decreasing. I was able to get interested very much. Because I did not know this living thing. I learned for the first time that biological Sasorimodoki, but it was very easy to understand. I didn’t know about this insect. But I get interested this insect. So,I want to know it more. Thank you for letting me read about good knowledge. I knew that Sasoro live in Okinawa,but did not know too in Kochi.Also I knew this species,but this species belong with spider,I know it at first. I want to look real Sasorimodoki,and if things go well I want to raise it. I have ever seen this insect in books. But I didn’t know about description.I remember the information about sasorimodoki. Looks scary… I don’t want to see this. I think to be able to face me if I have a weapon. But I think that is similar to the scorpion really.I think about to leave start slowly if I run into it.